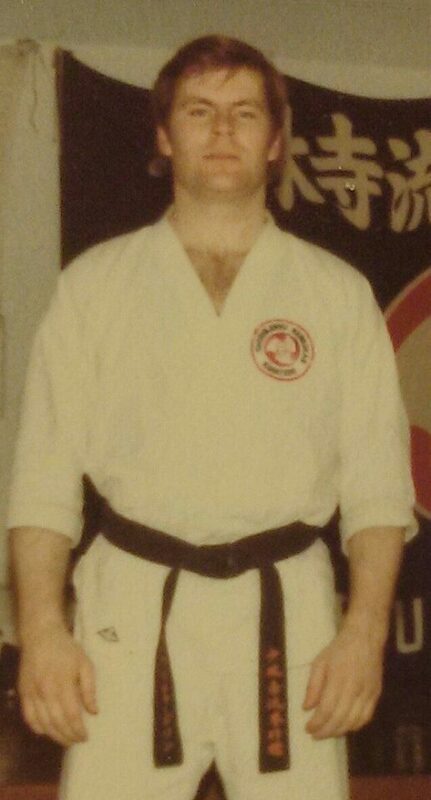 While an undergraduate student at Queen's University, Tim studied Shorinjiryu Kenyukai Karate from 1979-1983. After receiving his black belt in Shorinjiryu Karate in 1983, in Canada, Tim went to live in Tokyo, Japan. From 1983-85 Tim studied advanced karate at the headquarters of the Shorinjiryu Kenkokan Karate Fed. While in Japan, Tim competed with distinction in the Tokyo Koshiki Karate Championships (full-contact all styles), Eastern-Japan Championships, and All-Japan Koshiki (full-contact) Championships. Tim also holds an International "C" Class Referee License in Koshiki Karate. Koshiku is distinguished by the fact that combatants fight with bare hands and bare feet and with no padding on the shins. The only protection is chest armour and a face shield. Scoring is by striking with hands and feet, as well as throws, chokes and submission holds. All other styles of karate limit scoring to just kicks and punches. Koshiki is not a style of karate, it is an organized way of competing full-contact with bare hands, bare feet, wearing light chest body armour, and head-gear. Koshiki tournaments allow karate people of various styles to compete against each other, striking with full-power blows, to determine which techniques and styles are most effective. Koshiki Karate has been described as the "Rugby" of martial arts since it allows for realistic full-power striking. Koshiki tournaments are usually reserved for people at the black-belt level. The most common "style" of Koshiki participants is Shorinjiryu Kenkokan Karate, Kyukoshinkai Karate, Jujitsu. Koshiki Karate was developed in Japan by Kori Hisataka of Okinawa; his son, Dr. Masayuki Kukan Hisataka, who is the current head of the Shorinjiryu Kenkokan Karatedo Federation. While living in Japan, Tim also studied Iaido, the art of using katana to draw and cut in complicated patterns. Tim achieved black belt rank after 18 months training and was one of less than 5 non-Japanese to have been ranked by the Muso Shinden Ryu in the early 1980's. After studying in Japan in the early 1980's, Tim returned to Canada and taught and trained in Kingston, Ottawa, Winnipeg and since 1991 in Toronto. When it comes to "stuff on the web for the Shorinjiryu karatedo of Hisataka", Allen is THE MAN. Allen, in a very unselfish way, has spent many hours building up a site which is linked to and referred to by shorinjiryu black belts all around the world. It is my pleasure to call him a karate friend (and former university classmate) for more than 30 years.